In today’s global mindset of saving for the next generation it’s vital we all do our part to conserve our valuable water, air and electrical resources. When everyone plays their part to conserve around their Inland Empire area home, it can add up to huge saving for everyone! Here at Bella Terra Landscape Design we know a few things about conservation. All of our landscape designs tie in the needs of the customer with an earth friendly approach. Listed below are some clever and easy to do conservation methods when looking to the landscapes around your Inland Empire area home. When looking at the cheapest and easiest conservation method… look to how nature does it. Drought tolerant plants are a great way to make an immediate difference in the water consumption needed to keep your landscape looking green and vibrant; as well as giving your Inland Empire area home a great looking curb appeal. Now when you think about drought tolerant plants you mind might think of desert scape landscaping… but it does not have to be. There are several plants available that have beautiful, vibrant colors and textures that are certain to please the senses; while saving on water resources. Along with using plants that require less water, changing over to a drip water system instead of sprinklers is a great way to save on the utility bill, as well as conserving water resources for your Inland Empire area home. There is a major difference in how much water is needed to keep your plants and turf areas healthy between traditional sprinklers and a quality drip system. We recommend a drip system with inline check valves which ensure that all areas receive equal amounts of water slowly and efficiently. The days of over spray, runoff and uneven watering distribution should be a thing of the past with a quality drip water system. Smart water controllers are also a fantastic way to make sure watering is only done when needed for your Inland Empire area home. What makes these new controllers smart is the fact that they sync up with Weather Channel satellites through your Wi-Fi connection! This information will adjust the watering times of your irrigation zones based on your local weather. For example: when it is over cast and cool the watering times will automatically lower. When it is a hot summer day with 90 plus degrees, the system will increase its watering schedule. Naturally when it is raining, the system will automatically shut off. Now that’s smart! How do you keep your yard so nice all the time? Using synthetic turf is an ingenious way to conserve water PLUS saving you maintenance time and money for your Inland Empire area home. 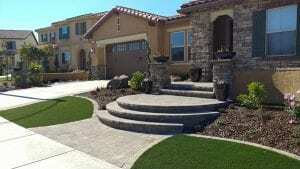 The days of fake looking green carpets laid over front yards that give the appearance of grass are long gone. There are new options for synthetic turf offering low cut, longer with varied blade heights and even some with brown thatching to give the turf an appearance of being a bit thirsty are readily available. This might sound cheesy and the install cost might be a little high; but consider not needing to water, mow or trim your yard! Plus the bonus of the neighbors always wondering… How do you keep your yard so nice all the time? Saving water is great but what about power? Having good outdoor landscape lighting is a necessity to help transform the outdoor landscape to an extension of your Inland Empire area home. Security, curb appeal and safety are often thought of as primary reasons for lighting and should be carefully planned out for both the need and the esthetic. In the past using low voltage halogen lights was the only to go; today much better options are available. LED based lighting fixture pricing has significantly dropped recently making available low energy lighting options for your Inland Empire area home. These fixtures are typically powered by a transformer that can be purchased with an option to turn the lights on and off on a timer or at a set program. This flexibility will not only bring functionality to the LED outdoor lighting but also save on the electric bill as well. At Bella Terra Landscape Design we strive to produce a design plan that exceeds the customers wants and needs. Conservation of our valuable resources is a fundamental part of the design and materials recommendations offered to the contractor as part of the development process. Beginning with a tour and discussion of the Inland Empire area yard we can design, in detail, a landscape design that best suits your family’s needs, wants and desire towards conservation. Selection of all the right plant materials that best introduces the vibrancy, color and texture to the property with an eye toward conservation is a trademark aspect of our design. 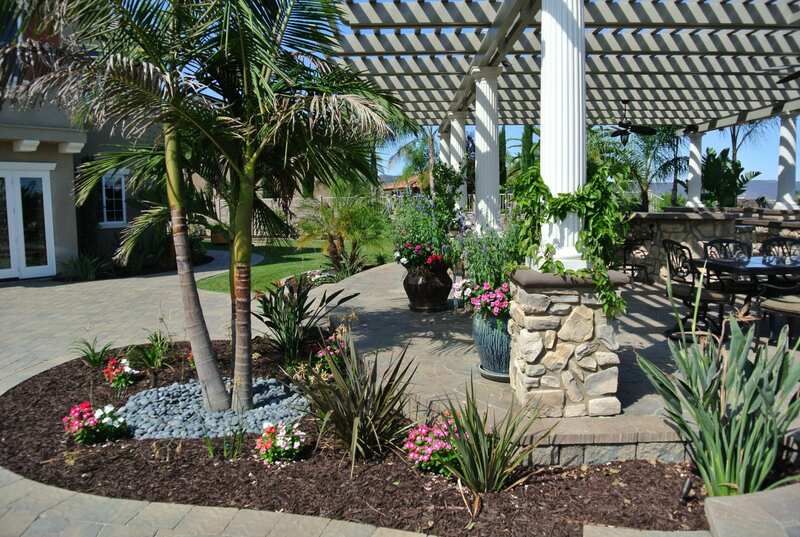 We take into account the plants, irrigation, layout and lighting to provide a complete format to transform your yard into an extension of your Inland Empire area home. Why do I need landscape design plans? Should I act as my own landscape Contractor?